Hey all, long time no blog… the pace of my life most definitely is speeding up the older I get! I’m just here to share a couple of things I’ve been working on. I have two technique articles out in a couple of national creative magazines. In Cloth Paper Scissors Magazine March/April issue I contributed an article about creating art on the iPad then printing on fabric and in Quilting Arts Magazine April/May issue I have an article about monoprinting on fabric and making an art quilt. I’m happy to be a contributor to these fine magazines it gives me the opportunity to share some of my mixed media trick and techniques with the wider world. You can get your hands on these magazines by following these links Quilting Arts Magazine & Cloth Paper Scissors Magazine. Here is one of the art quilts made from monoprint fabric that is featured in the Quilting Arts issue 92. I’m teaching a class on this technique “Gelli Print to Art Quilt in One Day” on Sunday March 25th from 10am- 4pm at The Bishop’s Ranch in Healdsburg CA. There is still room for a few more creative explorers- to sign up email me at artist@lisathorpe.com or go to http://lisathorpe.com/classes.html to learn more. Happy Valentine’s Day friends! I did this lesson with not long ago and I thought I’d share it with you for Valentine’s Day. I crammed a lot into the lesson with this kindergarten class but they really got it – I showed them Kandinsky’s Concentric Circles – which lead to defining the word concentric – then since Valentines was on the way we decided to do concentric hearts. I showed them the color wheel and shared the idea of hot and cold colors. I gave them the rules- 1. they had to draw concentric shapes; 2. they had to separate hot and cold colors. Then off to the art tables first to draw then to paint. They loved what they made and I loved watching them I hope you love it too! Have a love filled, creative day! Using oil pastels students drew a hot concentric hearts on one half of the paper and cold on the other…. then paint! The School year is beginning to wind down here in the west where school starts in mid August and ends in late May. My whole life I have been tied to a school schedule. My father was a teacher and school administrator and I am a teacher and parent so to me summer means – change of pace, a chance to breathe. I am deeply involved with one week of summer camp here at the Ranch but other than that I float around the edges, and that’s fine with me. It still annoys me a bit that my husband’s pace doesn’t slow during summer and in fact gets more intense but after 18 years of conflicting schedules I have just begun to find my own way. I like the way that working in schools gives a natural beginning and ending each year with space for reflection, and with the new school year a new beginning a new chance to create and inspire. This year is particularly poignant as the beginning of a very big ending is barreling my way. My only child will graduate from high school in a couple of weeks; he’ll spend the summer with working and hanging with friends then off to college on the east coast in the fall. I look to the beginning of the end with a mix of joy and sadness. I’ll miss my sweet boy in my life everyday but I am thrilled for his adventure ahead. And while part of me grieves for this ending another part rejoices for the beginning of a beginning that is just ahead. Now I’ll be an empty nester! What will I do with this new identity? I feel a strong urge to step out into something new as I launch my son I want to launch myself. For practical reasons I still need to work my two jobs as elementary art teacher in Healdsburg and resident artist at The Bishop’s Ranch but there is an itch to branch out. I have set my sights on a new form of teaching. I am developing a online class that I hope to offer by mid to late July. The first class will be a basic introduction to the ArtRage app that I have been using for much of my art this past year, and then I intend to develop some art journaling classes using the app. 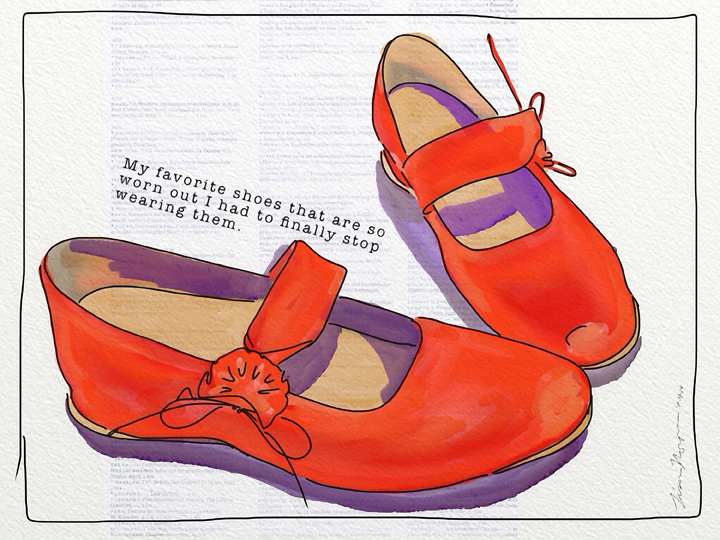 I took an online class from Jane LaFazio, who is a remarkably prolific art journal and mix media artist and teacher extraordinaire (Jane’s Blog), I took her introduction to watercolor art journaling class and used my iPad instead of traditional medium to see how that felt and to get some inspiration and tips (the shoe painting is from that class). I found it immensely helpful, and am working hard this summer to get my own classes launched so let me know what you think and any online class suggestions you might have would be lovely. I’m going to try to get back on the weekly or more blog posting pony… thanks for coming with me on the ride as I approach some awesome endings and beginnings I’m glad you’re out there.